I found this gem last night: Tremors Finally Getting a Reboot. 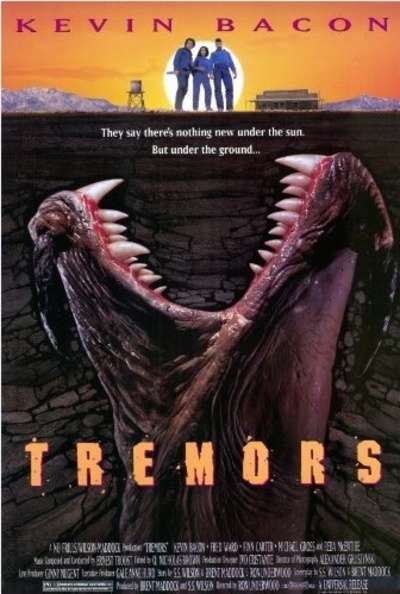 In case you don’t remember the Tremors movie, it was a horror/comedy (at least I think there was supposed to be a comedy aspect) about a small desert town where people start getting sucked into the ground and eaten by giant worms. Seriously. It starred Kevin Bacon, Fred Ward, Finn Cater, Micheal Gross and Reba McEntire. It was actually Reba’s first acting role outside of music videos. Here’s the trailer. I realize we are now in a world of reboots, but is this going to attract any attention? Did you like the original, or even see the original? I’m a little perplexed here so I’m looking for some outside opinions. I really liked this movie in the 80's, but am so sick of reboots! Get some original ideas people! I've never seen it. Is the trailer the original or the reboot? It looks like it could be one of the those things you could enjoy at home as something to watch in the background while doing something else. Not something worth seeing at the cinema though. That's the original, the reboot is still in the works. I always thought this was a B movie, at best. I was surprised that it spawned so many sequels (although they did go directly to VHS/DVD) and a TV series. I liked the first one as a teen but watching the trailer now, I'm kind of like, 'are you kidding me?'. Yes, because I am obsessed with movies about giant worms. I would miss Kevin Bacon though. Nope. It would just be a disappointment. Like if they rebooted Apocalypse Now or The Shining. Unlikely. I didn't see the original of this 1, being the age that I am! I've more into 'arthouse' movies. Heavenly Sword, a CG movie based on the video game. For real?